Maligned as killing machines, sharks are an essential part of healthy oceans. Millions of sharks are killed every year to fill soup bowls. Asians attribute many special properties to shark fins: They’re believed to have healing powers, retard aging and act as aphrodisiacs. I spot them in a bustling seafood market in Boston’s Chinatown neighborhood, arrayed on a high shelf behind the cash register: dried shark fins, sorted by size in large glass jars. Tan and warped, they look like rawhide chew toys for dogs, not prized delicacies—but appearances are deceiving. Fins measuring 4.5 to 5 inches start at $249 per pound, and the biggest ones top out at $499 a pound. Asians attribute many special properties to shark fins: They’re believed to have healing powers, retard aging and act as aphrodisiacs. Dubious as these claims are, fins have been used for many years in traditional medicines. Today they’re also in demand as a luxury food. Shark fins produce a high-protein gelatin when they’re simmered, which cooks use to thicken and enrich soup. At Chinese restaurants near this store, shark fin soup starts at $15 per portion and is a popular feature dish at wedding banquets. Millions of sharks are killed every year to fill soup bowls. According to the United Nations Food and Agricultural Organization, the yearly global catch of sharks and closely related species such as rays has tripled since 1950 and now averages about 800,000 metric tons annually. Some shark species are fished for their meat, but fins are the most valuable part of the shark, so many fishermen practice “finning.” They simply slice sharks’ fins off and dump the live, mutilated fish back into the ocean to drown or be killed by other predators. Sharks also are hooked and netted inadvertently by fishermen targeting other species. These unintended landings, known as bycatch, are common in fisheries for large pelagic (open-ocean) fish like tuna and swordfish, where boats set out lines up to 45 miles long rigged with thousands of baited hooks. Surveys of some pelagic longline fisheries have found that sharks accounted for up to one-fourth of total catch. Even if sharks are unhooked and thrown back, many die from associated injuries and stress. Defenders has worked for the conservation of sharks for years through the regulation of fisheries and the international trade in shark fins and other products. In previous years, Defenders succeeded in getting the endangered white, basking and whale sharks included on the Convention of International Trade of Endangered Species of Wild Fauna and Flora (CITES) lists that regulate or protect species from international trade. At the 2010 CITES meeting, we worked to get other shark species—the scalloped, great and smooth hammerheads, porbeagle, spiny dogfish, dusky, sandbar and white tip—included. A majority voted to include these species on the CITES list, but unfortunately a minority of parties led by Japan, China and other Asian coastal countries prevented the proposals from reaching the required two-thirds majority approval. Defenders will continue to seek the international protection needed for sharks at the next CITES meeting and in other regional and international treaties. Overfishing and bycatch are pushing many types of sharks to the edge. “On a one to 10 scale, if 10 is critical danger, most sharks are at seven or eight, and some species are at nine,” says George Burgess, director of the Florida Program for Shark Research at the state’s natural history museum in Gainesville. Last year the International Union for the Conservation of Nature (IUCN) assessed 64 species of open-ocean sharks and rays and reported that one-third were threatened with extinction, including great and scalloped hammerhead, porbeagle, oceanic whitetip, shortfin and longfin mako, and thresher sharks. Another study in 2007 estimated that between 1970 and 2005 the abundance of large shark species like blacktip, bull and tiger sharks along the U.S. Atlantic coast fell by as much as 99 percent. Thanks to movies like the 1975 blockbuster Jaws and the media’s obsession with shark attacks on humans, many Americans view sharks as mindless killers. Specialists work hard to show that on the contrary, sharks are highly evolved predators with preferences for specific food sources. Notably, there’s wide agreement that sharks do not feed on humans. Out of more than 400 shark species, only about 30 species have ever reportedly attacked humans. Three species—great white, tiger and bull sharks—account for most unprovoked attacks. That message is gaining traction, but what Burgess calls the “retro view” still persists. “Sharks should be portrayed more rationally in the media,” he says. “They kill about four people worldwide every year.” Over the past 50 years 25 people died from shark attacks throughout in the coastal United States, while 1,930 were killed by lightning strikes. Sharks’ bad rap may help justify over-hunting, especially by sport fishermen who see landing a big one as a combined macho achievement and public service. It also obscures sharks’ critical role as top-of-the-food-chain ocean predators. When such a species is eliminated, results can ripple down through the ecosystem in what scientists call a trophic cascade. 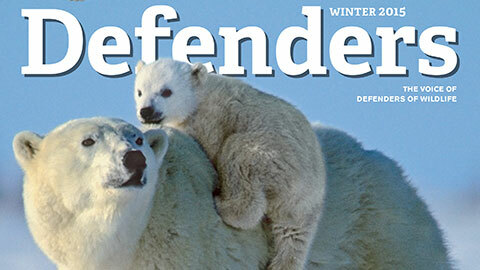 Become a Defenders’ Wildlife Guardian. Your contribution helps to protect sharks and other endangered species. For example, as large shark species declined along the mid-Atlantic coast of the United States over the past 30 years, populations of smaller rays and skates that had been shark prey exploded. Today cownose rays, which feed on shellfish, have decimated bay scallop harvests in the Chesapeake Bay and coastal North Carolina and may make it harder for other species like clams and oysters to recover from pollution and over-harvesting where restoration efforts are under way. Defenders work in Mexico resulted in the adoption of shark-fishing regulations that ban shark-finning, forbid the capture of endangered sharks, create several non-fishing refuge areas in sensitive breeding sites and ban the use of drift nets. Halfway around the globe, a study that compared four coral islands in the central Pacific—two of them relatively undisturbed by human impacts, the others home to several thousand people—found that underwater communities around the two uninhabited islands were dominated by sharks and other large predatory fish. Corals around these islands were more abundant and healthier than those near the inhabited islands, where small fish and algae accounted for much of the living matter. The undisturbed reefs also appeared to be more resistant to diseases and bleaching from warming ocean waters. The connection between abundant sharks and healthy coral may not seem obvious. But Jeremy Jackson, an oceanographer at the Scripps Institution in San Diego and coauthor of the reef study, argues that overfishing and other stresses like climate change and marine pollution are combining to reshape the world’s oceans. In his view, removing big predators like sharks unbalances local food chains and increases the growth of simple organisms like algae, microbes and jellyfish at the bottom levels—many of which feed on excess nutrients that humans discharge into the oceans. These small species multiply rapidly and eventually dominate the ecosystem, a process that Jackson calls “the rise of slime.” Around reefs they smother coral and inhibit reef growth. To ease pressure on sharks, many activists are zeroing in on finning. A year ago, the U.S. House of Representatives passed the Shark Conservation Act, which would tighten several existing laws that ban shark finning in U.S. waters (for example, by requiring that sharks must be landed with their fins naturally attached). Senator John Kerry (D-Mass) is sponsoring a Senate version of the bill, S. 850, which still awaited a vote as this issue went to press. Finning has also been banned in the Atlantic and Pacific oceans, the Gulf of Mexico and the Mediterranean by more than 60 countries that belong to international tuna fishery commissions and by individual nations and groups including the European Union, Costa Rica, Ecuador and Canada. But since shark fins fetch such high prices, bans are poorly enforced in many places. “It’s like fighting the drug trade—you have to address the demand side,” says Burgess. Asian restaurants and consumers are more resistant. “It’s challenging to deal with [Asian] restaurant owners because of cultural barriers. They see it as a very sensitive issue and as a tradition,” says Serda Ozbenian, a program associate at the Animal Welfare Institute in Washington, D.C., which is campaigning to persuade restaurants in the United States to remove shark fin soup from their menus. “We’ve educated a lot of restaurant owners who weren’t even aware that it was an issue, but what really gets their attention is complaints from consumers,” she says. Advocates are also working to reduce the toll from sport fishing, which takes place on a much smaller scale than commercial fishing but adds to the stress on some threatened shark species. Twenty-two marinas in the Bahamas, Fiji, Florida and Massachusetts have joined the Shark-Free Marina Initiative, founded in 2007 by Australian marine biologist Luke Tipple, which requires members to bar patrons from landing caught sharks for any purpose, including weighing, cleaning or displaying as trophies. The goal is to shift sport fishermen toward catch-and-release practices, giving them an incentive to support shark conservation in the process. Beyond these hot-button issues, scientists are analyzing ways to reduce shark bycatch in commercial fisheries. Most fishermen have an interest in reducing bycatch, since sharks prey on hooked fish, damage valuable fishing gear and are dangerous to handle when they are unintentionally hooked. Researchers are studying several kinds of shark repellents, including chemicals that are unpleasant to sharks and magnetic materials that over-stimulate the sensors that sharks use to detect prey. Some sharks are believed to live for over 100 years! Learn more about sharks and their habitat. There still are many unknowns about shark populations and how quickly species are dwindling, says Mandelman. “Scientific data is the foundation for good management strategies, and we still know very little about sharks,” he says. Ultimately, keeping sharks enthroned at the top of ocean food chains will require more effective national conservation policies. In 1999 United Nations member countries jointly agreed to develop national action plans for conserving and managing shark stocks. But only a handful of countries have done so. “The key is to develop good fishery plans with international cooperation and enforce them effectively, which isn’t easy. There’s a lot of politics and a lot of cheating,” says Burgess. Island nations that derive much of their income from tourism have led the way. Last fall the tiny Pacific archipelago of Palau banned commercial shark fishing completely from all of the waters in its “exclusive economic zone” extending 200 miles out from its coastline—some 237,000 square miles, an area roughly as large as France. “The strength and beauty of sharks is a natural barometer for the health of our oceans,” Palau’s president, Johnson Toribiong, told the United Nations General Assembly in announcing the ban. Earlier this year the Republic of Maldives in the Indian Ocean also banned shark fishing throughout its territory. But at an international conference in March, when the United States and Palau called for protecting eight threatened shark species, delegates approved limits for only one—the porbeagle. Novelist Peter Benchley, who helped to fuel public fear of sharks by writing Jaws, similarly came to appreciate their beauty and was an outspoken advocate for shark conservation for more than 20 years. “Sharks come from a wing of the dark castle where our nightmares live—deep water beyond our sight and understanding—and so they stimulate our fears and fantasies and imaginations,” he wrote four years before his death in 2006. With better understanding of how sharks help keep the oceans in balance, we can learn to see them in much the same way we view lions or wolves or grizzly bears: magnificent predators that deserve our protection and respect. Massachusetts-based freelance writer Jennifer Weeks specializes in stories about energy, the environment, science and technology.